[MBS-5978] – Replication feed is missing release_tag: This will not change any database tables but will finally include release_tag data in our Live Data Feed. [MBS-6709] – "None" is no longer the last Packaging type after adding Book and Cassette Case: See below for more details. 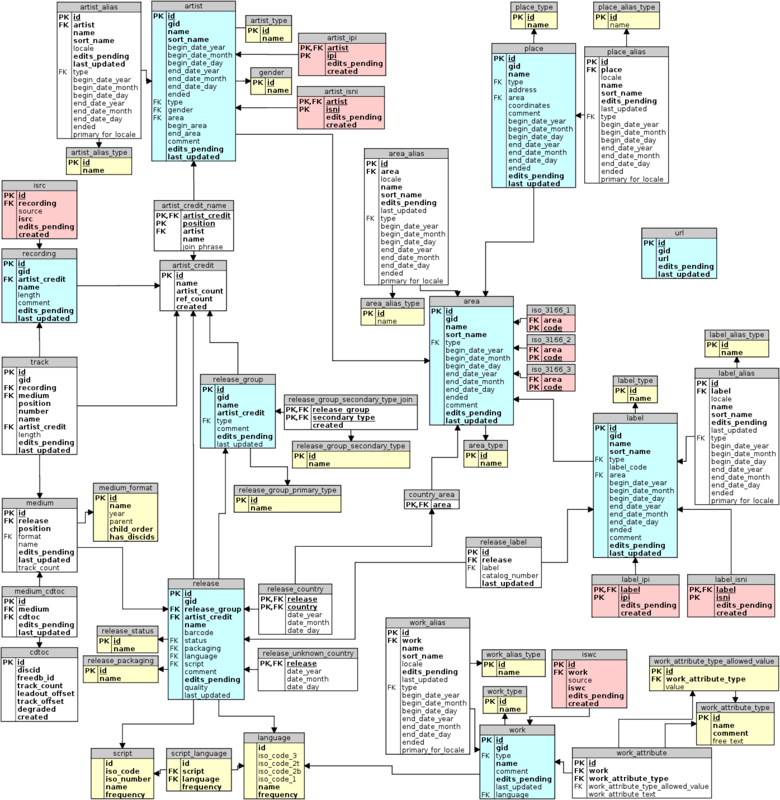 [MBS-2410] – Label types not a tree anymore: This bug and MBS-6709 add “parent”, “child_order” and “description” columns to all of the yellow tables on this diagram except for language, script and script_language. [MBS-2714] – Add support for Series: Details are provided in the ticket itself. [MBS-6144] – Remove the apparently-unused script_language table: Exactly what it says on the tin. [MBS-6602] – Remove sortnames from areas: Removes the sortname column from the area table. [MBS-6603] – Remove sortnames from labels: Removes the sortname column from the label table. [MBS-6651] – Make it possible to disable dates for relationship types: Adds a “has_dates” boolean column to link_type, to indicate whether a particular relationship type allows dates or not. The upgrade will set them all to “can have dates” for now and we will manually disable the appropriate ones later. [MBS-7205] – Link types should track assumed cardinality: Details are provided in the ticket itself. [MBS-3674] – Make instruments entities: This adds the following tables: instrument, instrument_type, instrument_gid_redirect, instrument_alias, instrument_alias_type, instrument_annotation, edit_instrument, l_*_instrument, l_instrument_* (the usual AR tables to other entities).